Lincoln Lookout sits perched overlooking the shoreline, islands, and the vast ocean beyond. This area known as the Mussel Ridge Channel is a major traffic lane for working and pleasure boats allowing ample opportunities to watch various maritime activities. Located above the shore on a cliff, there is shared access down to the rocky beach below via a tall set of stairs. From the broad deck and comfortable seating at the house you will see, hear, and smell the ocean below. The shore is accessible from this great water view home and within a few minutes drive are the sandy beaches - Crocketts Beach, Crescent Beach and the Birch Point Beach State Park. Restaurants, shopping and sightseeing are also very close in neighboring Rockland, St. George, Thomaston, Rockport and Camden. BEACH CLASSIFICATION: We have categorized this property as having or being near a sandy beach. More specifically for this property - it is a short 5 minute drive to three great area beaches. The closest is Crocketts Beach, but also Birch Point Beach State Park and Crescent Beach are other public beaches within 5 minutes of the property. There is not an actual usable sandy beach at this property, but the nearby beaches are great for kids and that is why we have classified it as being on or in this case - "near" sandy beaches. Owner Boats Included? : No, in fact, this property is not a good property to boat as the beach is too rocky to launch a boat from. TV: 1 Television with a DVD and basic cable service. An instruction video for the TV is located HERE. The ON THE WATER IN MAINE staff were great to work with. Paige, Meg and Nk were very responsive to any and all request. They are a great group of folks to work with -- A REAL PLUS!!! Lincoln Lookout proved to be the best vacation rental property we have enjoyed for the last ten years. It is a great central location from which to visit many attractions and events within 80 miles. The view from the deck is spectacular and there were no bugs this year. We had no problem removing our shoes to take care of the beautiful floors. We appreciated the overall cleanliness. Even without a dishwasher the dishes and cook ware were perfectly clean.The beds were comfortable. We appreciate the quality of the linens and other items provided, especially ALL of the kitchen items. The grill cooks steak very well and the second gas tank provided the fuel for my lobster burner. By the way TOM CAT LOBSTER on south shore drive is a great/clean place to buy lobster! Just 3 miles from the house. Very friendly & professional - couldn't be better! We love the view and the peaceful surroundings. I came to On the Water 6 years after a terrible experience while trying to secure a rent for our family vacation. We almost didn`t get one! On the Water in Maine is there for you. The hardest part of On the Water in Maine is too many great choices! As always every thing is as shown! We love being in this almost private, peaceful setting and yet we`re a short ride from everything. Checking in and out was easy. The list on their website of what was provided by the owner was helpful. We had no problems at the house, so we had no reason to contact the agency during our stay. OTWM is very pleasant to work with. Absolutely beautiful view. This is our favorite location. Always enjoy everything about location. The system in place by On the Water in Maine made the process seamless. The setting was wonderful. It was very private and peaceful. Always friendly and professional. We appreciate the agency's willingness to work with us to extend our stay by 4 days at a daily rate; (the property wasn't rented the next week). We enjoyed our stay very much. Aside from the great view, the big plus to this property is having furniture (both inside and out), that is very comfortable. After staying in the mid-coast area for a number of years, we have found comfortable furniture to be somewhat hard to come by. (Alot of places in this price range seem to be furnished with hand-me-down furniture that is long past its prime). Lincoln Lookout is a welcome exception. Great agency to work with - very professional and any questions or issues are resolved promptly. This is our 4th time renting from On the Water and we will continue to use their services. We loved our stay at Lincoln Lookout, it is a comfortable and cozy home. Beautiful ocean views from main living area and the deck. The house is older but had everything we needed and the kitchen was very well stocked. Comfortable beds. A great private and quiet location but access to downtown Rockland just 15 minutes away. This is our third year renting with On the Water. As such, very little direct communication was necessary, and all transactions and paperwork were handled smoothly and efficiently on- line. Lincoln lookout has wonderful views of the ocean. The view is as ever changing as the weather and is as beautiful by sunlight as it is by moonlight. The house is clean, attractive and welcoming. The deck is a superb place to unwind and watch the lobster boats at work. We loved the TV entertainment setup. We have been working with On the Water in Maine for several years now. As always, the rental process was well-explained and efficiently organized. We very much enjoyed our stay at Lincoln Lookout. it's a peaceful location with expansive views - just what we were looking for! You are a very professional company to work with and have quality homes to choose from. You always know your vacation property is clean and well kept. This is a wonderful location to view sunrises and watch lobster boats. No problem working with On the Water in Maine. Instructions about the house and area and directions were adequate. The view from the house and deck were lovely. The house itself needs some updating. The kitchen is too small for the number of guests (6) that the house can accommodate and the lack of a dishwasher was not pleasant for our party. Kitchen was well-stocked and the house was fairly clean. Very well equipped. Pots and pans more than adequate and like new. Comfortable beds. Warm house even though temperatures dropped to 34 degrees. No lack of dishes and glasses. Very comfortable and cozy. The website is easy to use and provides abundant information. The booking process is clear and efficient. Questions I had were pleasantly answered through email. The agency goes out of the way to assure that renters have plenty of information and that they know assistance is at the ready if needed. The agency is great to work with they think of everything. The directions are detailed and easy to follow. The view from the house was great. The house is well apointed. Efficient and straightforward. No complaints. Very comfortable and clean home. Beautiful water views, plenty of windows. Nice at-home feel. We'd stay here again for sure. Love working with On the Water in Maine. Easy payment, easy access to the house, easy contact info! It is a lovely house, clean and well kept. Loved the view! We have stayed in 5 or 6 houses on the Maine coast. Lincoln's Lookout was the best yet! It was convenient to shopping and activities. The bed was comfortable and clean. I had coffee each morning on the deck and wine or beer each evening. We saw many sea birds, sail boats, and lobster men working right in front of the house. Thank you for sharing your lovely home with us. We had a fun and relaxing vacation. The best. That was our 4th dealing with "On The Water In Maine" and we found the Agency to be very professional and helpful in every way. Wish we lived closer to make more frequent trips to Maine - and enjoy another stay on the ocean, via this Agency. A very lovely property and grounds for adults (not small children). 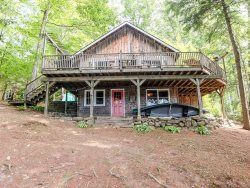 Lots of elegant privacy and quietness, beautiful views - especially from the ocean-facing windows and the deck, spectacular sun-rises, many eagles and deer to admire, very well equipped kitchen, comfortable beds, and an easy and quick access to Rockland. Please see our Policies Page for further questions regarding how to book this property and additional charges and fees.